ROCKIN’ ALL NIGHT VOL. 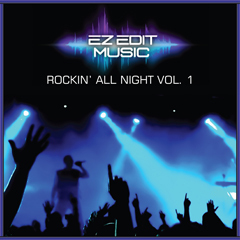 1 – Welcome to EZ Edit Music ! This collection is comprised of music loops that are useful for content requiring a rock feel with guitar - ranging from blues to country to metal, etc. "Burn The Rules" Stereo-mix plus stems. "A Country Mile" Stereo-mix plus stems. "Born Out West" Stereo-mix plus stems. "Slam The Gate" Stereo-mix plus stems. "Growing Younger" Stereo-mix plus stems. "No Cover Charge" Stereo-mix plus stems. "Willie's Saloon" Stereo-mix plus stems. "No Discipline" Stereo-mix plus stems. "Barefoot In The City" Stereo-mix plus stems. "Reach For Your Dream" Stereo-mix plus stems.